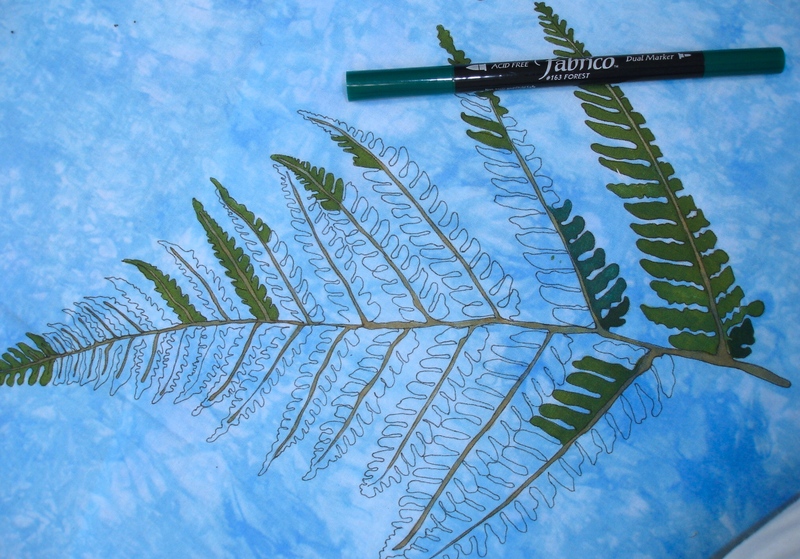 Drawing on fabric from nature – capture and create. I’ve talked a lot about this subject this year, and this is a very simple example of the genre. This project is one I designed as a class to do on a cruise. Cruise classes need to be simple and fast to complete and at the same time, you need to create an impact. I always try to follow the theme of the cruise and this one was to the Bahamas. If you come on the Thai or African trip, I have some exciting projects related to those themes too. 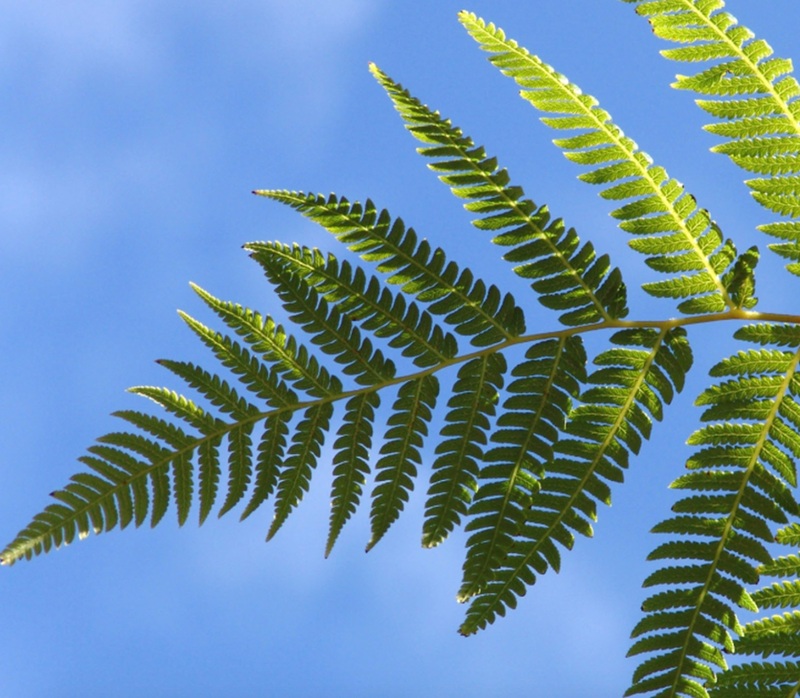 The image was taken from one of my photos, and to be honest I have no idea when I took it, it’s the tip of a frond of a tree-fern. From the photo I created the drawing by tracing my original photo onto sketch paper. I use a .5 pigment ink pen. It gives a clean line for imagery and tracing. 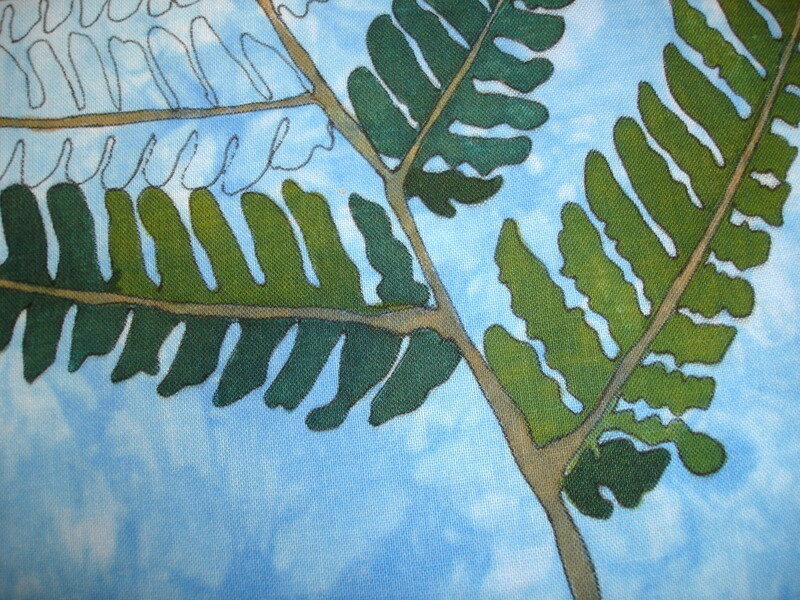 I used the same pigment ink pen to trace the image onto fabric. 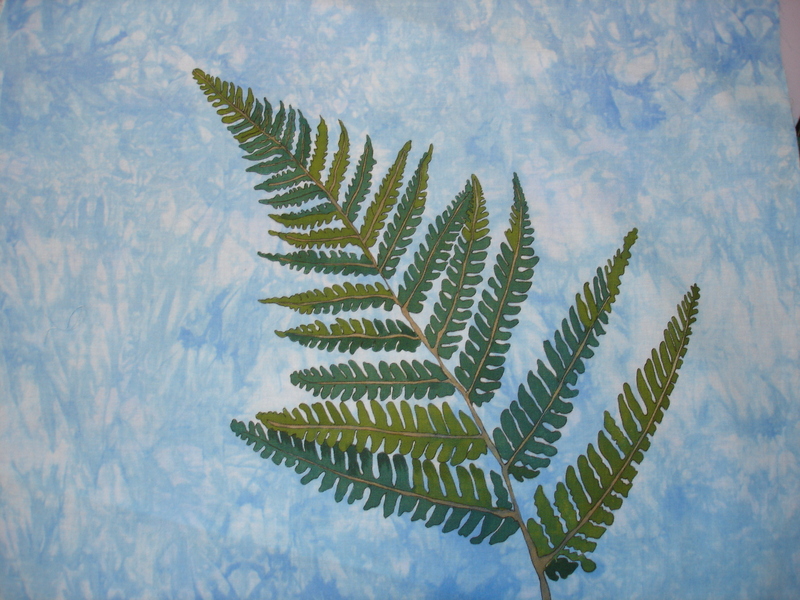 I placed the original drawing on the light box and traced the image onto the unwashed fabric. Then I began the process of coloring in the image with fabric pigment ink pens. I had a brown pen and 3 shades of green. The ink is permanent and once applied will never wash out. You don’t need to set the ink, trust me, once its on the fabric… it’s there for ever even through dozens of washes. The ink dyes the fabric as opposed to paint which just sits on the surface of the fabric and will ultimately shorten the life of the piece. 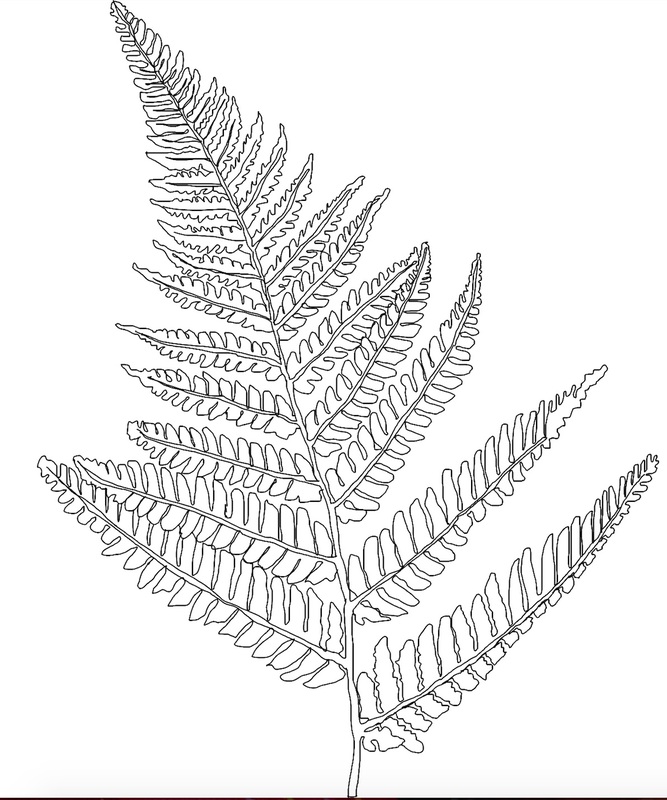 I’ve shaded under the fronds to give the impression of depth. Looking at the original image, I could have also used yellow, but I decided on the greens rather than introduce a color that needed blending. 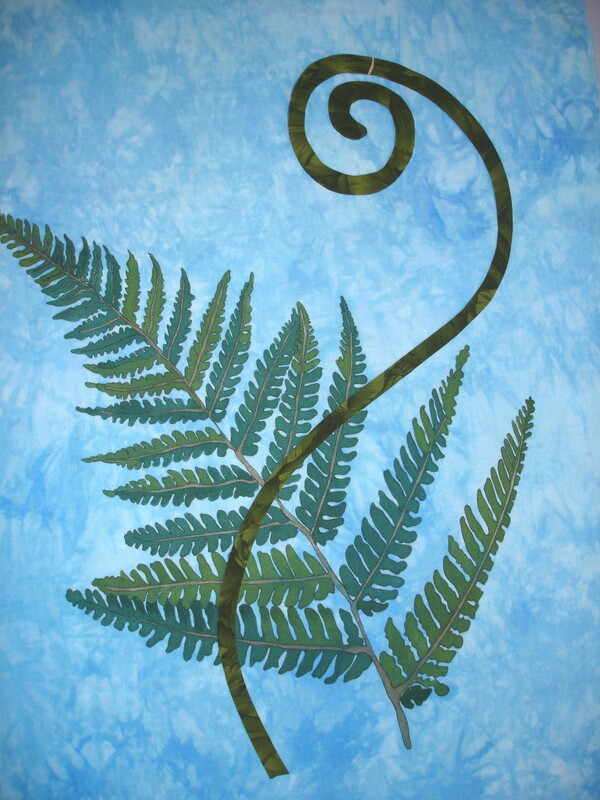 The next stage was to create the appliqué and I cut the focus frond from fabric, but used ink to add detail. 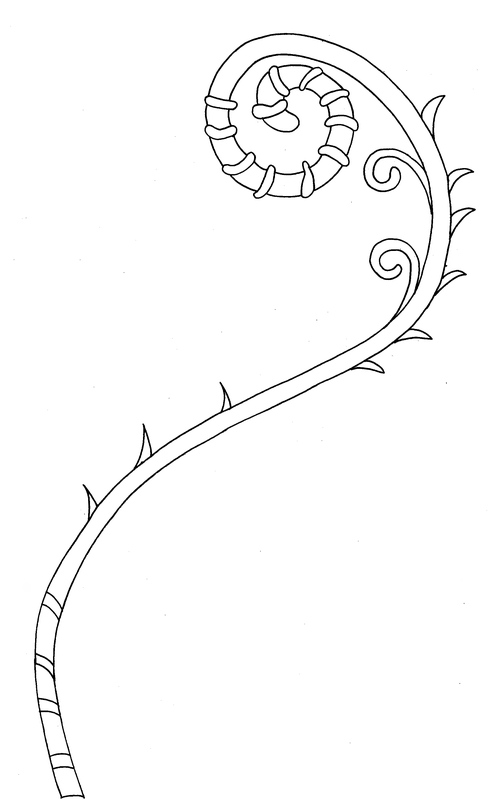 You can see in this image, the spikes and some of the whirly things are done in ink. I use about 9 colors out of the 40 or so that fabric have. 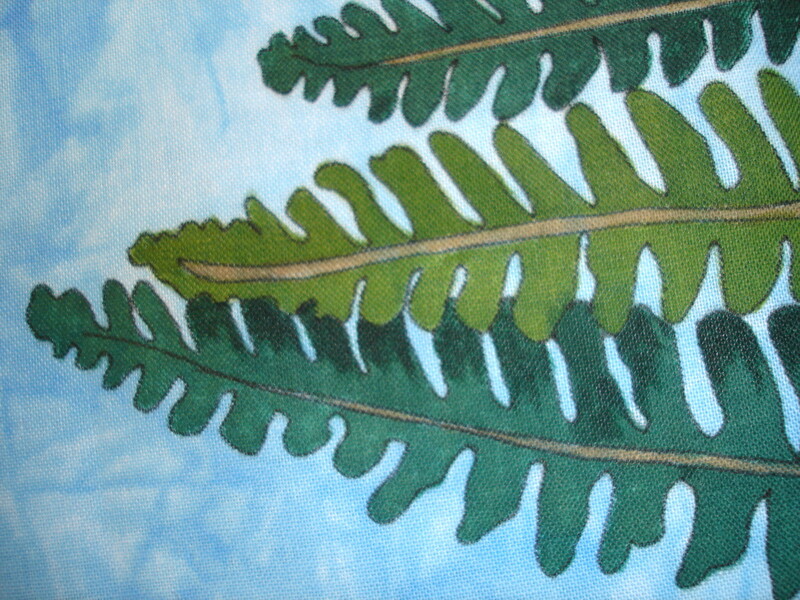 I use ‘mud’ colors, they have to blend in with the fabric colors which are almost always a ‘mud’ color. This is what I mean by ‘mud’ colors, I guess you could say its a pure color with grey added to it. 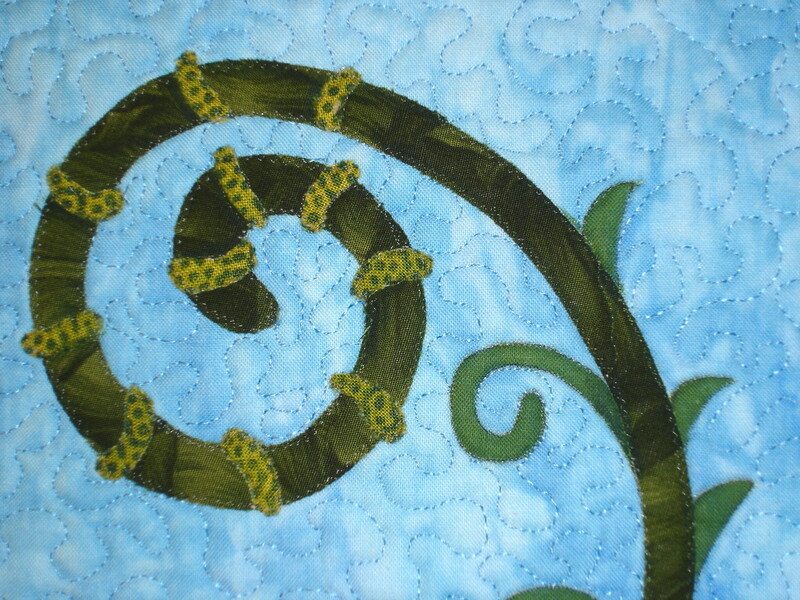 The quilt was sandwiched and appliquéd and quilted at the same time. 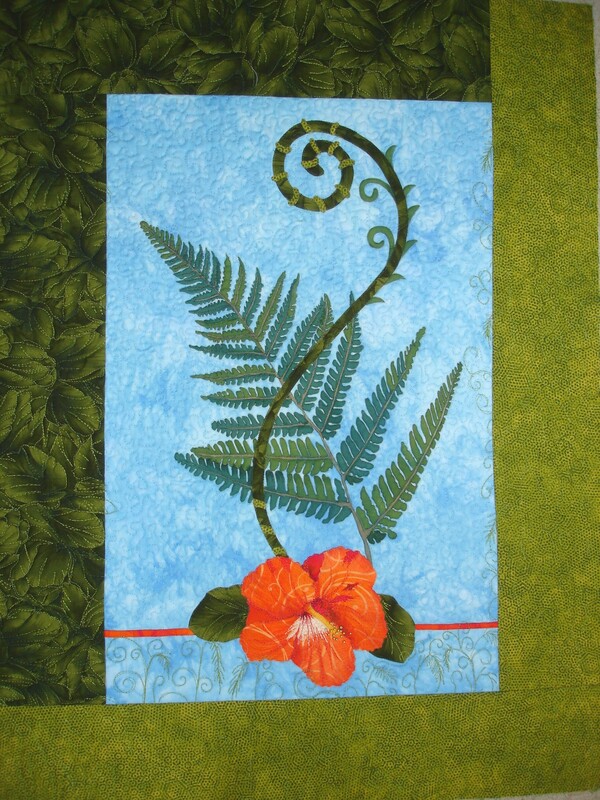 It’s not fancy, but its interesting and its a unique way to create your own fabric by drawing on the fabric then quilting it. How did you do applique- needle turn or raw edge or ???? 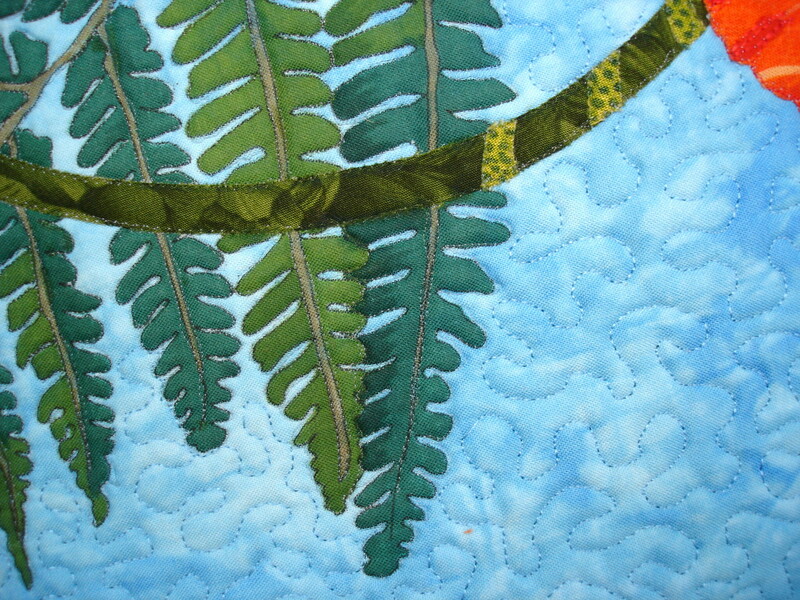 Susan, I do raw edge appliqué, the quilt is appliquéd and quilted at the same time. That means that I assemble the sandwich and appliqué through the three layers. I used monofilament and a small zig zag. 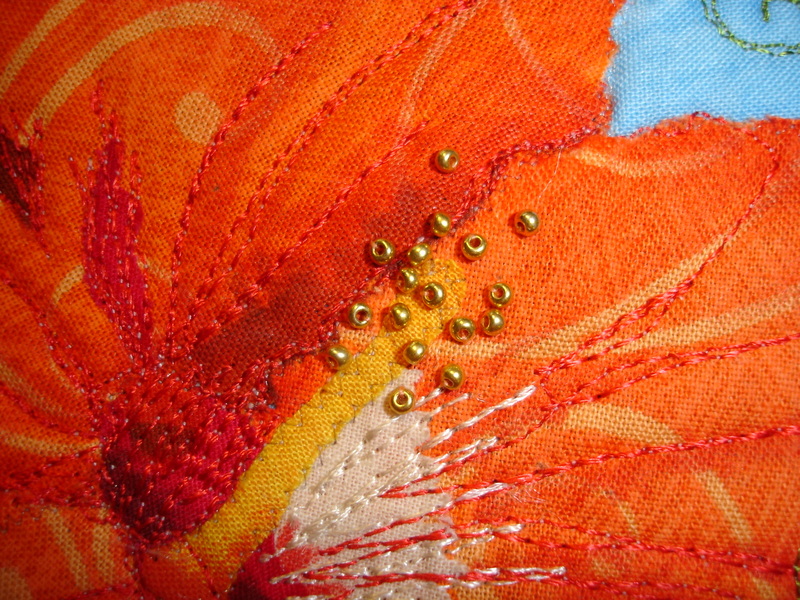 1.5 stitch width and 1.5 stitch length. I love seeing the entire process. Looking forward to Thailand. Next PostWhat happened to Alice Isabella?